I cannot remember who said that Coincidences are what is left over when you apply bad theories , but that is exactly what I think too. In a universe that is One Conscious Being I cannot see place for coincidence. But it is wiser not to talk to much about all this because I cannot prove any of all this. And my arguments have proven to be weak when I tested them on my best friends, so I have no hope that I can convince anybody else. I would never even want that, by the way. All I want is to share my thoughts and whatever else I can share with people who are interested in the stuff I have to offer. Here is something that happened to me about five years ago. And although I have no doubt that on you it will have little to none of the impact it had to me, I tell it anyway. What else can we do but tell stories? 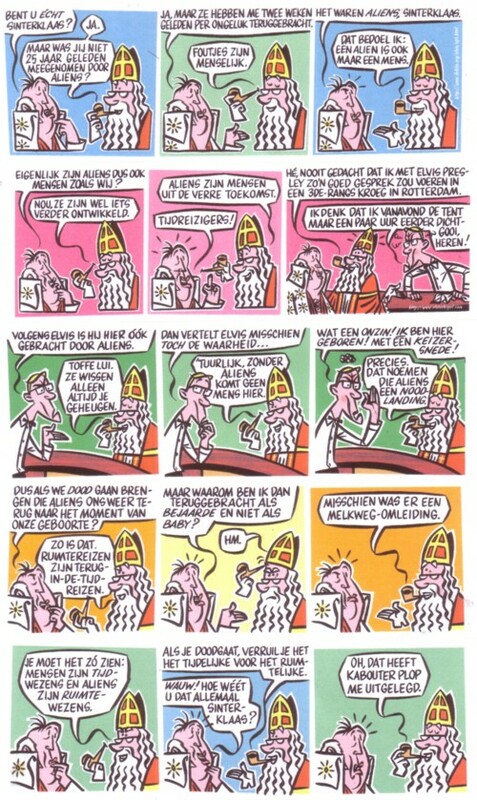 I was asked to write 36 episodes of a comic for a Dutch daily newspaper, Het Algemeen dagblad . 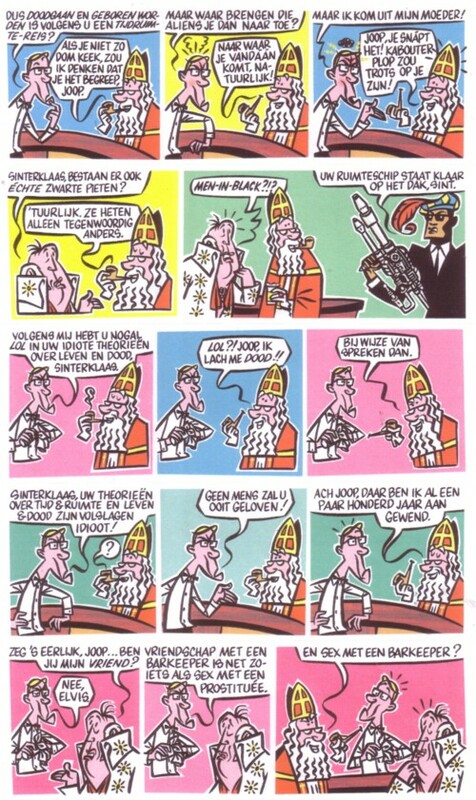 Actually they asked Pieter Dorrenboom for this comic story, but since he believes he is no good at writing, and since we had done several comics together, he asked me to write the 36 jokes for him. As always I had no idea what to write about, so I decided to write an absurd story about the comeback of Elvis. The main reason for that was that Pieter hates Elvis. 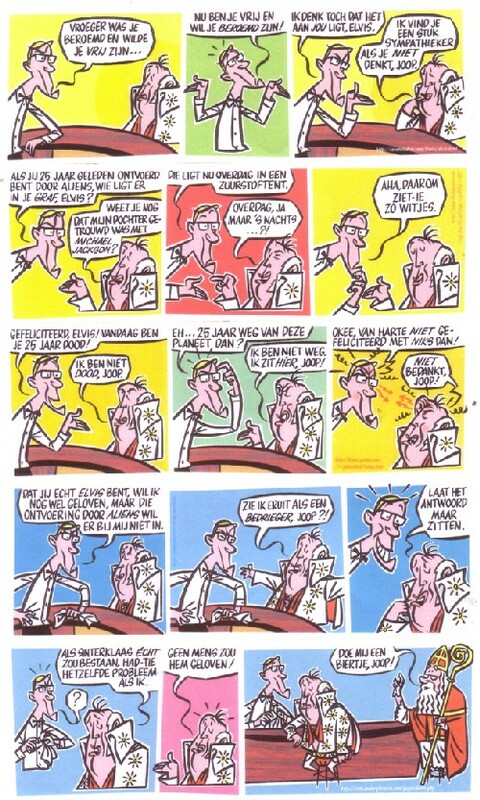 Each episode was just one strip (I don’t know the English word, but I mean the kind of daily comics you see in newspapers), and it had to be funny, but I wanted to whole series to be readable as a story too. It turned out that I had little inspiration, and a few days before the deadline I began to worry I might not make it. This would be strange, because usually inspiration comes easy to me. The problem was that I wanted to write a story that didn’t want to be told. In the back of my mind I also felt another story, that was pushing itself to be told, but I hesitated to tell that. I thought that that story was too weird, too esoteric. On previous occasions the newspaper editor had said that what I wrote was way too difficult for their audience. I never really believed that, but I didn’t wanted to screw up this job. The night before the deadline I saw no other choice than to write the story as it formed in my mind. And that went very quick: while writing I got one present after the other and although I had serious doubts about how people would react on it, I could hand it in in time and with the personal certainty that a miracle had happened. At that time I was struggling with some weird but beautiful experiences that I had a few years earlier. That experiences had changed my look on things completely. They left me with some profound insights, which I desperately wanted to share with others. But hardly anybody seemed to be interested and I encountered so much disbelief that I felt very disappointed. The miracle was that I realised that I had written this comic for myself: this was a message to myself. It is impossible to explain this in all its details, but for example: the comic is about a song that is the anthem of Feyenoord, a soccer team that is from the same town as the newspaper, Geen woorden maar daden . At that precise moment Elvis had a hit with the Junkie XL remix of A little less conversation I didn’t know that when I began writing the story, but when I found it out, I used this coincidence in the scenario. But only after I gave up my resistance to telling the story as it presented itself, I realised that Geen woorden maar daden , which literally means no words, but deeds , is basically a translation of A little less conversation, a little more action . There were much more coincidences like this, in fact so much that I had no doubt that it were no coincidences at all. The message to myself was clear: action speaks louder that words! I should walk my talk in stead of preaching on other peoples practices. A hard lesson, but just what I needed.